Slice Deli and Cakery opened its classic American deli and gourmet bakery last November in Fountain Valley. It’s an inspiring story of perseverance. Owners John-Michael Sanchez and fiancé Natalie Burke intended to open Slice in January of 2015. But, when Burke was diagnosed with cervical cancer that same month, they were forced to put the project on hold. In July of 2015, Burke had won her battle with cervical cancer and was eager to start working on the restaurant again. Today, Sanchez and a cancer-free Burke proudly present Slice, a single concept with dual identities. John-Michael Sanchez is our guest. GD Bro began as a culinary passion project for co-founders, Mark Cruz and Kevin Nguyen, who had ambitious and creative ideas for a “new” way to eat burgers. Within a year’s time, as word spread via an organic social media frenzy and growing lines of hungry guests, GD Bro teamed up with Hue Nguyen, current CFO and foodie enthusiast, to expand on GD Bro’s cutting edge brand and style. Co-founder Kevin Nguyen joins us with the juicy details. TAPS Fish House & Brewery (Brea, Corona & Irvine) has always been known as a pioneer in brewing award-winning craft beer. Recently proprietor Joe Manzella, not one to ever stand still, decided it was time to totally overhaul and elevate his bar program system-wide. Corporate Wine & Spirits Manager, Andrew Aoun has done just that. We’ll chat with him about what it takes to totally revamp a successful bar program. Hundreds of premium wine varieties, sweet and savory chocolate confections, gourmet food samples from acclaimed Pechanga Resort & Casino restaurants, live music, a silent auction and helping out a good cause are all on the agenda for February 26 and 27 at Pechanga Resort & Casino. Tickets for the 8th annual Chocolate Decadence and Pechanga Wine Festival are on sale now. Proceeds from both events benefit Habitat for Humanity Inland Valley. Pechanga Resort & Casino’s Executive Pastry Chef, Jean-Jacques Granet joins us with all the sweetly decadent details. Finally we’ll get some thoughts on food trucks from our Co-host, Chef Andrew Gruel. Since opening in early 2013, GD Bro has been favorably mentioned among the best of the best in local, regional, national media outlets and online Food Bloggers. GD Bro also premiered on Season 6 of the FOOD NETWORK’s Great Food Truck Race taking a nail biting third place spot. Now known for their inventive and light-hearted approach to cooking, GD Bro is consistently challenging the traditional concept of a “burger” by selecting new and uniquely blended ingredients that surprise and delight the foodie traditionalists and culinary thrill-seekers alike. GD Bro not only takes pride in delivering a consistent signature product but more importantly, they believe both great service and above and beyond hospitality from their caring, gracious, hip and outgoing staff distinguishes them from their competitors. Hence, the reason the GD Bro followers have an “emotional” attachment to the brand and feel like they are part of a family backyard BBQ atmosphere. The original brick- and- mortar location is in Santa Ana and newly opened in Signal Hill. For each new location there will be a special menu item only available at that unit. GD Bro began as a culinary passion project for co-founders, Mark Cruz and Kevin Nguyen, who had ambitious and creative ideas for a “new” way to eat burgers. Within a year’s time, as word spread via an organic social media frenzy and growing lines of hungry guests, GD Bro teamed up with Hue Nguyen, current CFO and foodie enthusiast, to expand on GD Bro’s cutting edge brand and style. Co-founder Kevin Nguyen joins us with the hot & juicy details. Finally we’ll get some thoughts from our Co-host, Chef Andrew Gruel. Slice Deli and Cakery opened its classic American deli and gourmet bakery last November in Fountain Valley. It’s an inspiring story of perseverance. Owners John-Michael Sanchez and fiancé Natalie Burke intended to open Slice in January of 2015. But, when Burke was diagnosed with cervical cancer that same month, they were forced to put the project on hold. In July of 2015, Burke had won her battle with cervical cancer and was eager to start working on the restaurant again. Today, Sanchez and a cancer-free Burke proudly present Slice, a single concept with dual identities. Prior to her battle with cancer, Burke owned a successful custom cake business. Much like the savory items at Slice, the cakes are prepared using traditional European methods; artfully crafted from whole ingredients. The Cakery features her signature cakes served by the slice daily. Guests are also able to order customized cakes for weddings and other celebrations. The Cakery also features classic scratch-made pastries and fresh breads baked in-house daily by seasoned pastry chef, Aldo Mendiola. The kitchen at Slice is helmed by Executive Chef Julio de Leon who focuses on classic American cooking highlighted with superior ingredients. His dishes feature humanely raised meats, locally sourced produce, and house-made ingredients. From breads to spreads, everything at Slice is made in-house daily. The Deli offers house-cured meats complemented with artisanal cheeses, sliced to order. Menu highlights include premium deli sandwiches like The Cuban with mojo pulled pork, stout mustard, Black Forest ham, Emmenthaler Swiss, and house pickles on house-baked bread. In the evenings, the menu transforms to offer dishes prepared with a focus on traditional techniques. Highlights include a Porchetta Roast which features a crisped pork belly wrapped around a juicy pork loin slow-roasted for two days. Quality, house-made ingredients take center stage with dishes like the Lamb T-Bone prepared with garam masala, stout demi-glace, and mint gremolata. Slice also features a rotating selection of 20 beer taps with an emphasis on Orange County-based breweries as well as regional wines from the West Coast. Since opening in early 2013, GD Bro has been favorably mentioned among the best of the best in local, regional, national media outlets and online Food Bloggers . GD Bro also premiered on Season 6 of the FOOD NETWORK’s Great Food Truck Race taking a nail- biting third place spot. GD Bro followers have an “emotional” attachment to the brand and feel like they are part of a family backyard BBQ atmosphere. TAPS Fish House & Brewery (Brea, Corona & Irvine) has always been known as a pioneer in brewing award-winning craft beer. Recently proprietor Joe Manzanella, not one to stand still, decided it was time to totally overhaul and elevate his bar program system-wide. Corporate Wine & Spirits Manager, Andrew Aoun has done just that. We’ll chat with him about what it takes to totally revamp a successful bar program. The relaunch is in place at Taps Fish House & Brewery. The Catch, and Lillie’s Q.
Taps is known for their long-history of brewing award -winning craft beers but they also want to elevate the rest of their bar program. There is a new emphasis on freshness and quality ingredients. All mixers and juices are prepared fresh. Even the Grenadine is made in-house. There is a big difference in flavor. The everyday well spirits have been elevated, too. No low end spirits in the well. All premium labels. A new cocktail is the Pineapple Under The Sea. It’s made with Absolut Elyx Vodka and Corruba Coconut Rum. It’s served in an eye-catching copper Pineapple. Going to be hard to hang on to those. The show-stopper is the Lime In The Coconut with Corruba Coconut Rum and Selvarey Cocoa Rum. It’s prepared tableside in dramatic fashion. It’s frozen “Mad Scientist”-style with liquid nitrogen and served in a coconut shell. undreds of premium wine varieties, sweet and savory chocolate confections, gourmet food samples from acclaimed Pechanga Resort & Casino restaurants, live music, a silent auction and helping out a good cause are all on the agenda for February 26 and 27 at Pechanga Resort & Casino. Tickets for the 8th annual Chocolate Decadence and Pechanga Wine Festival are on sale now. Proceeds from both events benefit Habitat for Humanity Inland Valley. Finally a chance to catch-up with our esteemed Co-host Chef Andrew Gruel. Chef Andrew is always the source of quality information with keen insight. Are gourmet food trucks still a viable business in Southern California ? We’ll ask Chef Andrew to weigh-in. We’re all over these great United States today with celebrated chefs, a local food entrepreneur, and bargain dining at extraordinary restaurants in Orange County for the next week. When we spoke with Thomas Keller back in December he was giving us the background on the talented American chef representing the USA in the prestigious Bocuse d’Or culinary competition in Lyon, France in late January. That distinguished chef is Richard Rosendale, the executive chef of the historic Greenbrier Resort in West Virginia. You’ve no doubt heard about The Lime Truck, one of Orange County’s pioneering gourmet food trucks. Perhaps you’ve even enjoyed one of their Ultimate Tacos. It’s been so successful that there are now three of them on the road in Orange and Los Angeles Counties. The food is both original and tasty. The fame of The Lime Truck is now national. In a spirited competition The Lime Truck deftly maneuvered it’s way across the USA on Food Network’s “Great Food Truck Race” (Season 2) and crossed the finish line first. That earned young food entrepreneur Daniel Shemtob and his colleagues a $50,000 cash prize. Last year Daniel debuted his first bricks and mortar spot in Westwood Village. TLT Food has an expanded menu and a thoughtful collection of craft beers and boutique wines. You’ll actually see Daniel there regularly cooking! On Tuesday evening, February 26th super chef Marcus Samuelsson will be joining forces with Chef Govind Armstrong (Table 8) to present “A Taste of Harlem” at Govind’s new restaurant, Post & Beam, located in Baldwin Hills. The menu is reimagined soul classics. A portion of the proceeds will be donated to C-CAP Los Angeles. Unfortunately the dinner reached capacity some two weeks ago. The good news is that an After Party benefiting C-CAP has been added so foodies will have a chance to meet Chef Marcus and Chef Armstrong and enjoy some good music. Chef Govind Armstrong will be with us to talk about the festivities and how to obtain a coveted ticket for the After Party. Orange County Restaurant Week (The 5th Annual) starts on Sunday and it’s your chance to experience Orange County’s best for lunch and dinner at very consumer-friendly special pricing! Yes, it’s a real bargain. The 2013 OC Restaurant Week will be held Sunday, February 24th through Saturday, March 2nd. Executive Chef Roy Hendrickson of Zimzala Restaurant & Bar at The Shorebreak Hotel in Huntington Beach and proprietress/restaurateur Nancy Wilhelm and Executive Chef Rayne Frey of Tabu Grill in Laguna Beach will all be in-studio to reveal their ambitious menu creations for OC Restaurant Week. It’s a grab bag of treats on the Oct. 13th show so don’t miss a moment. If you follow Food Network’s “Great Food Truck Race” then you know they changed things up dramatically for Season 3 and the level of competition was even harder. This season the contestants had no experience operating a food truck. Each team was given the food truck of their dreams to start things off in Long Beach last Summer. Each week as a team was eliminated they needed to turn their keys over and go home. They were competing for their own custom, fully equipped food truck (representing the competitor’s chosen cuisine) and a cool $50,000 cash prize. The dramatic finale was Los Angeles versus New Jersey. 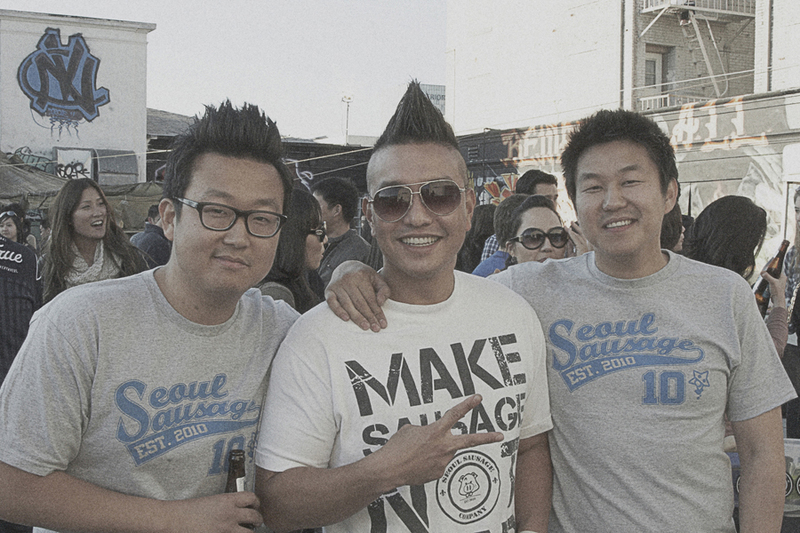 Our very own Yong Kim, Ted Kim, and Chef Chris Oh from K-Town prevailed with their Seoul Sausage Co. concept. They made friends all across the country on the way to the finale in Maine. It’s their signature fusion sausages and innovative flaming fried balls (which were developed during the show.) They didn’t have enough money in the beginning to buy a sausage machine so they had to adapt their menu. Yong, Ted, and Chef Chris will all be with us to recount their incredible journey! They have just opened a Seoul Sausage Co. outlet in Little Osaka in West L.A. 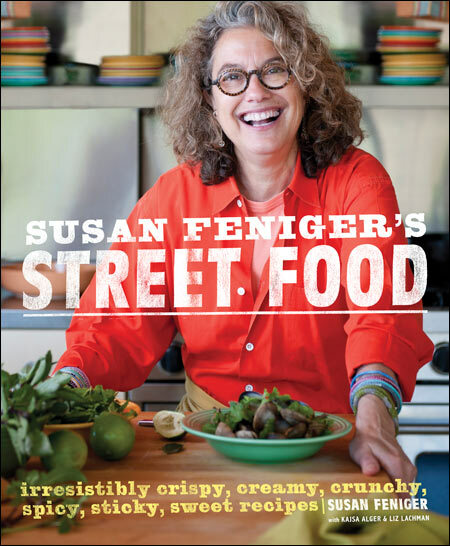 The truck will be back on the streets of L.A. in November. How about a glass of wine with all the conversation? Sommelier William Lewis of The Winery Restaurant and Wine Bar in Tustin’s The District is next in the house. William was the recipient of the “Wine List of the Year” Award at the recent Golden Foodie Awards in Newport Beach. He’ll speak about what to expect from a Sommelier and how he arrives at his suggestions for truly inspired wine and food pairings. Finally it’s Cal Poly Pomona’s 20th Anniversary Pumpkin Festival on Oct. 20th & 21st from 8 to 5:00 p.m. hosted by their Farm Store and the College of Agriculture. Admission to this family-friendly event is free and some 50,000 pumpkins will be in the patch! Pumpkin Festival Hotline is (909) 869-2215.